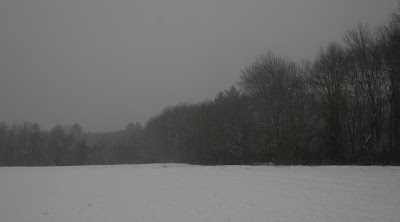 The dreary winter of 2012 has returned. The soft, white snow of last weekend has given way to rain and slush. All week as daytime temperatures rose into the 40s, the snow melted away inch by inch, and there wasn't much to begin with. Snow-packed trails turned into ice-covered slippery lanes. Even the dogs were having trouble, skating past each other when they tried to meet up. This morning the driveway was covered in two inches of slushy snow. Light snow during the night changed over to rain, which will continue into the afternoon. Rain-drenched goldfinches continue to dominate the bird feeders. A red squirrel hangs out below them, taking advantage of their sloppy eating style. The week ahead looks to be above normal--mostly sunny and in the 40s. At this point in the season I'd like all the snow to melt and then have a fresh start in February. Though, the Farmer's Almanac predicts unsettled weather ahead with more wet snow in store. One goldfinch is sporting bright new yellow feathers on its back--a sunny spot on an otherwise gray, gloomy day. We are fascinated by Kodi's starkly different reactions to foxes versus coyotes. In the pecking order of wild canids it goes by size: wolves are at the top, followed by coyotes, then foxes. Here in the northeast, the small red fox (10 to 15 pounds) avoids its larger competitor the 35 to 40 pound coyote whenever possible. Kodi weighs in at 50 pounds, but falls between the red fox and the coyote in the pecking order. Kodi will not accompany me on walks in certain places - those areas where coyote sign is strong and domestic dog evidence is low. 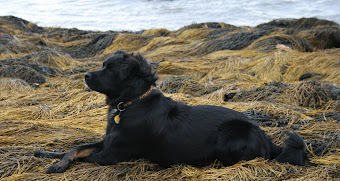 If he smells coyote in the air, or sniffs its urine on a twig, or picks up a coyote track, he tucks his tail and ears and turns back toward home. A fox track elicits the opposite reaction. When Kodi picks up the scent of a fox, he runs fast in search of the next track, with tail up and spirits high. I spent the weekend at my parent's Winterberry Farm in western Massachusetts where both coyote and fox roam. Kodi is reluctant to follow me down into the fields in the back forty, where coyotes travel daily. 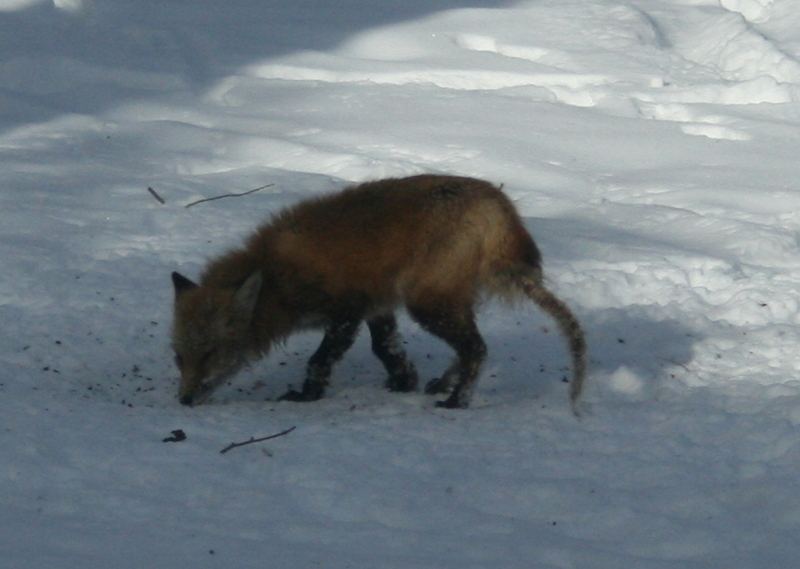 On Saturday at noon I happen to look outside at the bird feeders and there was a red fox feeding on spilled bits of suet and seeds. He was a mangy looking fox, which is likely why he was seeking food beneath a feeder at mid-day. Mange often kills in winter as the animal is unable to stay warm given the loss of so much fur. Finding food to stay warm is critical. I waited about a half hour before going outside with Kodi. I wanted to see if he immediately picked up on the fox scent. Sure enough, as soon as we reached the feeders he started sniffing, found the track, then darted in a big circle where the fox had wandered. Kodi was moving fast and I was worried that he might follow the fox track across a busy road so I leashed him up. I let Kodi follow the tracks which led down to one of the back fields. Then we crossed a much larger coyote track. Kodi immediately noticed without any prompting from me. He looked up, sniffed the air, and started back the way we came. Soon, we picked up the fox track and his mood changed again. The thrill of the pursuit was on again. For the two years that we've had Kodi he has never seen a fox or a coyote up close. His first year of life was spent in a kennel and who knows where else in Indiana. So, his ability to separate coyote from fox seems completely innate and entirely by scent. We've never had a dog that behaved this way with wild canids. It is fascinating, although also frustrating when Kodi refuses to venture into coyote territory. Coyotes are common, so there are some wonderful places that Kodi will not go. Back at the feeders, Kodi trotted over to several small shrubs and tree seedlings, raised his leg, and urinated. Kodi was alerting the fox that this was his territory. Canid researchers call this "raised leg urination," a key part of the canid scent-marking toolkit. Upon our return to New Hampshire, Kodi immediately insisted on a walk around the neighborhood so he could deploy his own raised leg urination to let friend and foe alike know that he was back. We are enjoying a few fine days of winter, before freezing rain and rain tomorrow disturb the tranquility and beauty of the fresh snow. Yesterday Kodi and I walked a woodland trail at my parents Winterberry Farm during the snowstorm that left 5 inches of soft snow. Kodi with tail down followed a coyote track; he is nervous in coyote country. This morning Kodi and I hiked a favorite nearby trail, a woodland trail that leads to the top of Rattlesnake Knob and away from where coyotes roam, a place that I've written about before. Kodi and I both took note of the patterns in the snow. He noted a fox track and the network of porcupine trails that likely led to a den in the rock outcrops on the slopes of Rattlesnake Knob. I noted the many woodland mice that left their dainty tracks at the base of trees and around fallen logs. 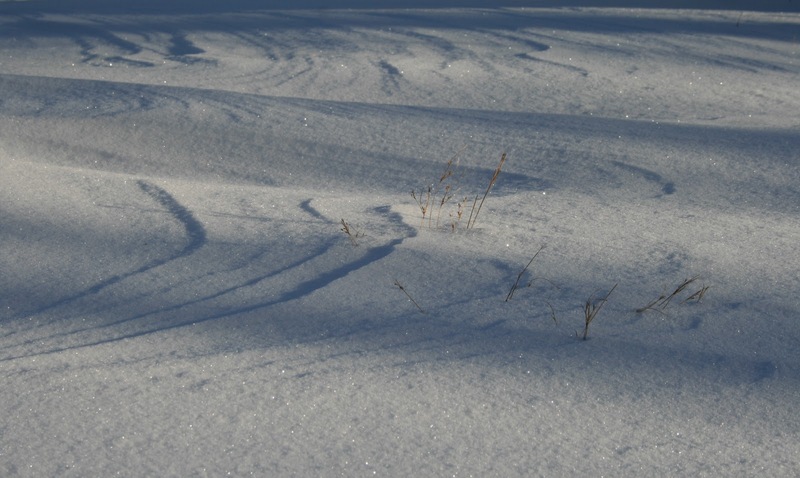 The wind that sweeps across the ridge that ends at Rattlesnake Knob left artistic patterns in the snow. A morning after a fresh snow is a precious time to be in the woods. Two to three inches of beautiful powdery snow fell overnight, then the skies cleared and the temperature remained below freezing. This was one of the those perfect winter days, of which we've seen little of so far. Kodi and I traveled to western Massachusetts today, taking the slower, scenic route along Route 101. We stopped at Miller State Park on the border of Temple and Peterborough in southern New Hampshire for a hike up to the summit of 2,290-foot Pack Monadnock. I was pleasantly surprised to see a State Park truck spreading sand at the entrance to the parking area when we arrived at mid-morning. The parking area was large and accessible even though the new snow had not been plowed. Two guys were just returning to their cars after hiking up and suggested some traction, so I strapped on the microspikes. We opted for the 1.3 mile auto road that leads to the top of the mountain; it is gated in winter. The woods were beautiful in their fresh blanket of snow. The auto road has a gentle grade that gets steeper near the top. We reached the summit within 45 minutes going at a relaxed pace. 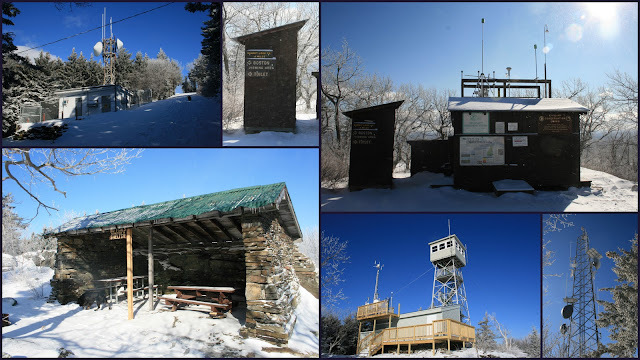 The summit looks like a small village with a fire tower, air monitoring station, cell towers, radio tower, picnic shelters and tables, and some other stuff. It must get a little claustrophobic in summer when people can drive to the top. Today though Kodi and I had the windswept peak and the views (including a clear view of Mount Monadnock) to ourselves. As we started down I was startled by a truck driving up the road. Apparently the air monitoring station is monitored routinely so perhaps that was where they were headed. Here is a collage of some of the structures on top. I'd like to return to this area in the warm season. The 21-mile Wapack Trail runs in both directions from this park and there appears to be some interesting lands in the vicinity including The Nature Conservancy's Joanne Bass Bross Preserve and the Wapack National Wildlife Refuge. A trail map for Miller State Park is available here. Our jaunt this morning took only 1 hour 15 minutes so it is a nice spot for a quick walk or you could spend all day exploring the greater surroundings. I plan to return. A cold west wind whistles through the trees, ruffling the feathers of small birds and tousling the hairs on a red squirrel's tail. A red and gray squirrel trade places beneath the feeder. The smaller red squirrel moves quickly, perhaps nervously, attentive to defending its space against the larger gray squirrel. Once it feels safe the red squirrel quietly feeds on sunflower seeds spilled by birds, its tail curved along its back. While one or more gray squirrels visit the feeders every morning, I see the red squirrel only on the coldest of days, such as today. He spends most of the day at or near the feeders. Then at 3:00 pm he darts off to a nearby white pine, then scurries back toward the deeper woods, where I assume he'll spend the night curled up in a nest of leaves. The gray squirrels retreated to their tree nests of leaves and twigs earlier in the day. A flock of two dozen goldfinches comes every morning and stays until early afternoon, by which time they've consumed most of the nijer and sunflower seeds in each feeder. They are more piggish than the squirrels. And they are rather dull in plumage in January. The squirrels are more colorful, in pelage and in antics. So I watch the squirrels not the birds from my home office window. By late afternoon a handful of tufted titmice return, darting to and from the feeders along with chickadees. Most birds stay away on these windy days. Winter is with us in fits and starts this year. Yesterday morning a beautiful coating of fresh snow greeted us at daybreak, by day's end rain drops rippled in the pools of melted snow on the driveway. The animals seem to fare just fine with the ups and downs of cold and warm, snow and rain, wind and fog. My body takes longer to acclimate. Yesterday I soaked up the warm afternoon sun. Today's cold wind chills my bones. Time to do as the animals do. Get up and move around, some stretches, some exercises, take in some food. Oh, and fill the bird feeders (for the squirrels). Crawford Notch. 8:30 am. Minus 6 degrees Fahrenheit. Wind chill somewhere near 20 below or colder. Our group of five (plus Kodi) hoisted our heavy winter packs and with the wind swirling through the Notch we hiked past the Crawford train depot and ducked into the woods and out of the wind. No escaping the cold, however. Our destination was 3,442-foot Mt. Avalon, and beyond if conditions allowed. Yesterday we debated back and forth whether to attempt a hike on such a cold day. The temperature was forecast to remain below zero. But the views on such a clear, cold day would be spectacular. 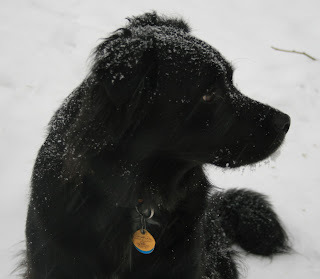 We worried about Kodi's paws, but he's performed well before and seems to like the cold. However, sub-zero snow underfoot is another thing entirely. The Avalon Trail was well-packed and we progressed easily in our bare boots. The beauty of winter hiking is that regardless of the temperature, when you start hiking uphill you warm up quickly. We were all pretty comfortable, except for Kodi. The first 1.3 miles of the Avalon Trail is an easy grade. At the juncture with the A-Z Trail, Avalon Trail turns left and begins a steep climb for 0.5 miles to the short spur that leads to the top of Mt. Avalon. We moved slowly up the 1/2 mile pitch as we sucked in the cold mountain air with deep breaths. Kodi stopped often to lick his paws, his warm tongue soothing his cold feet and melting small ice balls that formed between his toes. The 100 yard spur to the top of Mt. Avalon is beautiful in winter. The peaks in Crawford Notch were more socked in than we expected so distant views were non-existent. Views close in made up for some of the lack of sweeping views. Two gray jays entertained Kodi enough that he forgot about his cold paws for a bit. We were protected from the fierce winds atop Mt. Avalon so we lingered a little longer. We descended back to the small col below the summit and decided that for Kodi we needed to turn back, rather than continue on and up to Mt. Field and over to Mt. Tom. I think our hiking companions have all grown fond of Kodi and readily agreed to shorten the trip. Secretly some of us didn't mind heading back down to a warmer place too. It was cold. We arrived back at the AMC Highland Center parking lot around noon. Temperature minus 4 degrees Fahrenheit. Many hardy folk were on the trails today; we passed people going up and down on the Avalon Trail. Back at the Highland Center we spread out our lunch and snacks from our packs in the dining room and warmed our bodies with hot soup. It felt good to have hiked to Mt. Avalon and back and it felt good to have our lunch inside rather than trail side on the slopes of a frigid Mt. Field. Kodi was glad to be snuggling back in his crate in the car. He was fine, although we need to check out dog booties for future cold, winter hikes. On the drive home we paused briefly at the Intervale to take in the spectacular view of Mt. Washington - clear and cold in the distance. Four bluebirds - two females and two males - made a brief stop at our bird feeders yesterday. That was a first. In mild winters bluebirds do stay around southeastern New Hampshire. Typically I see them in the trees bordering the nearby Mitchell fields along Bald Hill Road. Bluebirds eat mostly insects, with fruit more prominent in their fall and winter diet. The bluebirds that stopped by yesterday were mostly observing, one looked down at the ground, like a robin sensing a worm. Given the mild winter of 2011-2012, it would not surprise me to find a worm on a warm afternoon. Some days it gets quite cold, but then it warms to 40+ degrees. The woods are bare and a little dull without snow. 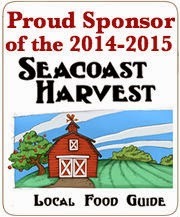 I began collating my seed order yesterday and measured my garden. It is hard to believe that the outdoor planting time is still three months away. Snowmobiling and ice fishing are not my thing, but I appreciate that those who depend on these activities are having a tough year. Thin ice and bare trails prevail. My winter spirits were lifted last evening when I drove home after a meeting, as the wolf moon was rising. I heard no wolves (or coyotes, which would be more likely here) howling, but the moon was a gorgeous light orange color as it emerged on the horizon among slivers of clouds. Snow, sleet, and rain are in the forecast this week....perhaps a tease that winter will arrive before spring. Yesterday we completed our first winter hike of 2012 to the summit of 4,043-foot Mt. Passaconaway. The high summits forecast called for cold northwest winds in excess of 50 mph, so our initial plan to hike to Mt. Flume or the Kinsmans was swapped for a more wind-protected hike to Passaconaway. We set out with our hiking companions John, Paul, and Mike at 8:50 am from the Ferncroft parking lot. Eight hours later we arrived back at the cars as a waxing moon appeared overhead among shifting clouds as daylight faded with the setting sun. It was a long (9.4 miles) but beautiful hike via Old Mast Road to Walden Trail to the summit, then back down on Dicey's Mill Trail. As other hikers know, there is little snow in the woods and lots of ice on some sections of trails. The initial 2-mile leg of the hike was a gentle grade along Old Mast Road. The microspikes were put on our boots early in the hike as what little snow there was underfoot was icy or crusty. We reached the Walden Trail in good time. According to the White Mountain Guide, the Walden Trail was significantly reconstructed recently by the Wonalancet Outdoor Club. Although it is harder to see improvements when snow and ice are covering the trail, we greatly appreciate the hard work that the volunteer crew completed. The Walden Trail includes several ups and downs and with ice bulges in some steeper spots it was slow going. The trail passes many large boulders and ice flows and Kodi was thinking that he prefers deep powdery snow to the ice. There was more snow at the higher elevations and the descent on Dicey's Mill Trail was covered in enough soft snow that ice was not a problem, allowing for a relatively quick descent. We briefly encountered a bit of what John called "sneet," not quite snow and not quite sleet. On the final climb to the summit we passed through an area where one or more moose had rubbed its antlers on fir trees, stripping them of bark. We saw tracks of moose, snowshoe hare, grouse, and fisher. Bits of mountain ash berries were dropped on the trail up high, while yellow birch catkins and beechnut husks were strewn on Dicey's Mill Trail as we descended, in area with many bear-clawed beech trees. I heard a boreal chickadee and a robin, but mostly the woods were silent except for the sound of own breaths as we climbed. It took us 5 1/2 hours to reach the summit of Mt. Passaconaway. At 2:15 pm we were looking east and north from the outlook just below the summit (which is in the woods). Although the temperature was below freezing and somewhere the wind was blowing strong, we were well-protected and not feeling cold (tired yes!). After a few final looks at the high summits to the north we began the 4.6-mile descent on Dicey's Mill Trail. The going was relatively easy compared to the ascent, and we reached the parking lot within 2 1/2 hours. There was just enough light that headlamps were not needed and it is always a nice sight to emerge into the fields at Ferncroft and walk past the well-kept farmhouse, the private landowners who kindly allow us all to hike right past their house and barn. Thanks to John for selecting this loop hike; we were out of the wind almost all day and he knew the trail well having recently hiked it by himself. Thanks Paul for the hand-up on a few steep pitches and to Mike for the gingerbread cookies back at the car. Kodi slept soundly all the way home. A week ago yesterday we were atop the 4,000+ foot Camel's Hump in western Vermont. The sky was clear, the temperature in the teens, no wind. Yesterday we were at sea level at Seapoint Beach in Kittery, Maine. The sky was gray with thick rain clouds, the temperature hovered at 32 F, and a light, but cold, northwest wind blew across the sands. It felt colder yesterday, everything was gray. And yet, there was still so much to see and explore. A small flock of bufflehead bobbed and dived just offshore. A handful of purple sandpipers stood on the big rocks that jut into the water; this sandpiper breeds on the tundra and spends its winters along our coast while other shorebirds head farther south. Two snow buntings, another arctic breeder, flitted on the rocky beach. A larger flock of ring-billed gulls foraged in the wrack at the edge of the tide line. The wrack was full of myriad types of kelp, sponges, mussels, and other creatures. Seapoint Beach has two types of beaches. One long stretch is flat and sandy, this is where the wrack was deposited at high tide, where the gulls were feeding. Farther down and around a rocky point the beach changes. It becomes steeper, with deep piles of rounded stones shaped over eons by the rush of the tides. As we walked this stretch, we listened to the swoosh of the tide as it slid back down the pebbly slope, acting like a giant percussion rainstick. As we walked back to the cars, Kodi and his two friends Quercus and Persica, sat for a treat. All three loved exploring the beach in winter, as did we.